- The biggest, most comprehensive county season preview in the game. - Our famous, colour-coded wallchart, displaying every domestic and international fixture. 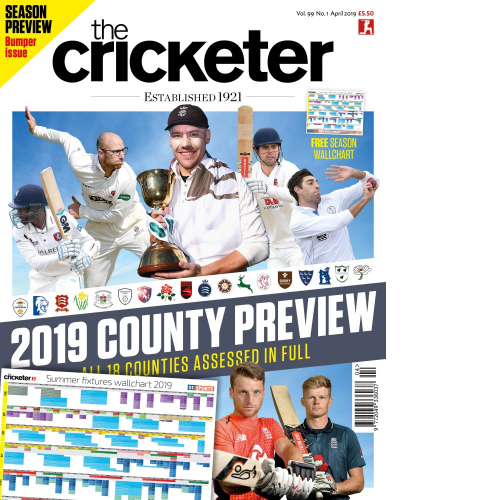 - Two pages on each of the 18 first-class counties, with prospects, squads, stats and fixtures. - Exclusive Jos Buttler interview by Simon Hughes. - Launch of our 2019 campaigns investigating decline of secondary school and recreational cricket. - Bob Taylor by Simon Barnes in My Favourite Cricketer. This item will be dispatched by Royal Mail in the UK and via our international carrier for all overseas orders. Please allow extra transit times during the Christmas and New Year period.